Summary: The Volusia Sea Turtle Society will upgrade and modernize its presentation equipment and materials currently used for the twenty five to fifty marine turtle educational lectures, displays and presentations they give each year. VSTS is now using a slide projector and screen that was donated to the group by the Volusia County School Board many years ago after the County upgraded their own presentation equipment. 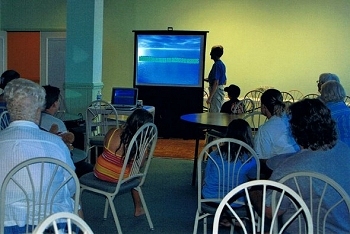 It is the wish of VSTS to upgrade to a laptop computer with Microsoft software that includes Power Point 2003 and Publisher 2003, a Power Point projector and portable projecting screen, carrying cases and a color printer. This equipment will allow VSTS to continually update presentations and generate work/activity books that will be given to presentation participants. VSTS will also use the new equipment to advertise lecture and presentation availability in brochures that are handed out during daily sea turtle surveys, public events and are also displayed and distributed in many local businesses. It is the intent of VSTS to increase awareness and support among locals and visitors regarding the Florida marine turtle conservation program and other beach-related conservation issues.